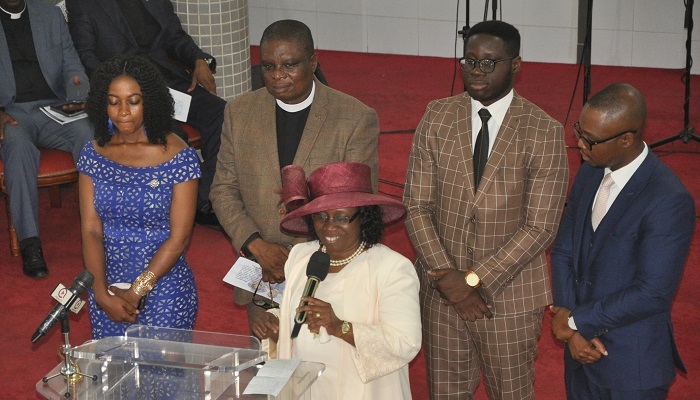 In a joyous atmosphere, members of The Church of Pentecost in La Area and beyond gathered at the Dr. Thomas Wyatt Memorial Temple on Sunday, September 9, 2018, to bid farewell to the outgone Area Head, Apostle John Appiah Aidoo and his family, who have currently left for Tarkwa Area. The well-patronized event had people from all walks of life in attendance, including ministers of the Church, family members, among others. Prophet David Kankam Beditor, an Executive Council Member of The Church of Pentecost and Agona Swedru Area Head, who officiated the service, in a message titled: “Never Get Tired,” entreated Christians not to be complacent in their service to the Body of Christ since there are more parcels of land to be possessed. “What is left to be done is more than what has been done,” he asserted. Taking his Scripture readings from Joshua 13:1-6 and Galatians 6:9-10, Prophet Kankam emphasized that tiredness in the mind, unanswered prayer, unrecognised effort or lack of appreciation for what one is doing, delayed hope or desire, “pull him down” syndrome, complacency, among others, are some of the factors that can make one to be weary. He admonished believers not to get tired of prayer, giving, desiring the Holy Spirit baptism and gifts of the Holy Spirit, evangelism and discipleship, building a cordial relationship with fellow brethren and neighbours, participating in Bible Studies and Home Cell meetings, desiring godly marriage and living an exemplary family life, serving God wholeheartedly, among others. Prophet Kankam concluded by saying that those who never get tired will possess the land, receive the best rewards, receive everlasting life, will be richly blessed by God, among others. Apostle John Appiah Aidoo took over the administration of La Area in 2013 from Apostle Francis Ofori Yeboah (now retired). Under his tenure, the Area has acquired a set of canopies and platforms for outdoor programmes, permanent places of worship for some assemblies, established Area Youth Entrepreneurship Programme (AYEP) to help the youth start businesses with start-up capital provided by the Area, instituted the La Area Scholarship Scheme (LASS), among other achievements. Apostle John Appiah Aidoo is gifted in the teaching ministry and the grace to spot people with giftings for ministry. It was during his stewardship that the La Area had a Youth Pastor. In attendance were Apostle Massaboi M. Zuwu (Liberia National Head), Apostle Dr. Jimmy Markin (Evangelism Ministry Director), Apostle Fred Tiakor (Children’s Ministry Director), Apostle Anthony Ahalivor (Madina Area Head), Apostle (Maj.) B. G. Kumi-Woode (Burma Camp Resident Minister), and Apostle (Chief Supt) James T. Tetteh, the Chaplain-General of the Ghana Prisons Service. Also in attendance were Mrs. Rose Kumi-Larbi (wife of the General Secretary), Deaconess Margaret Osei (Deputy Director of the Women’s Ministry), Mrs. Salomey Appiah (wife of Dubai National Head) and Mrs. Elizabeth Larbi Wettey (wife of the Tema Area Head).